Table tennis bats for beginners - What to pay attention to? If you want to learn playing table tennis (TT), pretty soon you will recognize that your own table tennis skills are not the only important ingredient. There is also a huge dependency on the table tennis (or ping pong) racket you are using. 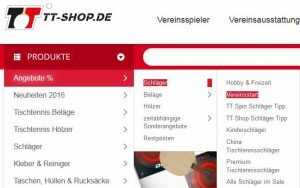 The following report aims in providing concrete product recommendations and suggestions for hobby and recreational TT players. A table tennis / ping pong paddle (or racket) for beginners should be chosen thoroughly since a beginner should also make good overall progress in relatively short time. Normally, a slow TT racket with good control supports a beginner. This is because when starting to play table tennis, the most important criteria is to safely serve the ball over the net, onto the other half of the table - as often as possible. Hence, typical table tennis paddles for beginners are based on a slow blade, and slow rubbers exhibiting a thin sponge. Also, such bats for hobby and recreation are quite inexpensive. 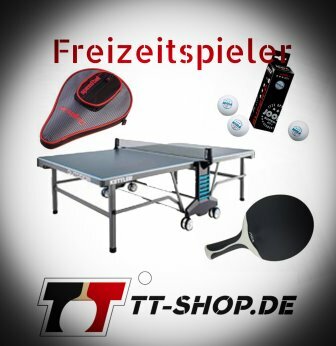 In our category rackets for hobby & recreation, you can find many good examples of table tennis rackets and TT sets for hobby activities. For your very first steps in the world of table tennis, these are absolutely satisfactory. For beginners, we can truly recommend the ping pong paddle Joola Match. This product is highly suitable for an absolute beginner. We also offer attractive quantity discounts: Hence, you can get several TT bats for your home. In case you might already be a bit more experienced, exhibiting a better level, the Donic Schildkröt Waldner 600 Premium (set of 2 bats) might be the right choice for you. Compared to other cheap(er) bats for beginners, this table tennis bat allows a clearly improved development of active spin. Furthermore, the Waldner 600 exhibits a higher speed which makes attacking strokes faster, and harder. In case you hear the term professional table tennis racket for the very first time, you might think of a bat used by Timo Boll or Dimitrij Ovtcharov. However, this is not really correct. All club players are using so called professional materials! A professional table tennis bat is made of a blade which is based on thoroughly chosen, well-matched layers (plies or veneers) of various materials, such as woods, and sometimes synthetic materials. Also, professional bats consist of 2 high-quality, branded rubbers, which are selected individually. The rubbers are glued onto the blade using a special adhesive. How the rubbers are glued in detail, will be mentioned in another article. 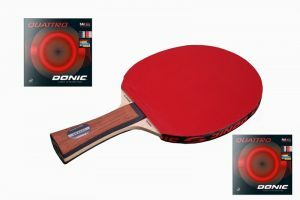 Such a professional table tennis paddle is not necessarily expensive, and may even be matched to the needs of a table tennis beginner who just joined a TT club. This is achieved by choosing slow components (blade, rubbers). At this point we would like to mention that of course, also a hobby player can buy a racket which is designed for (official) competitions. Starting at a price level of approx. 50 €, this is even recommended since more expensive bats from big stores cannot keep up with professional products in terms of quality, and gaming properties. 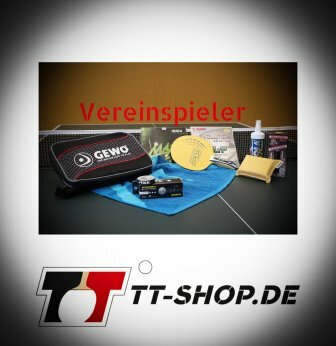 At tt-shop.com you can find a large selection of table tennis blades and table tennis rubbers, which you can select and compile by yourself as required. A free assembly of the rubbers you have selected is - of course - also possible. 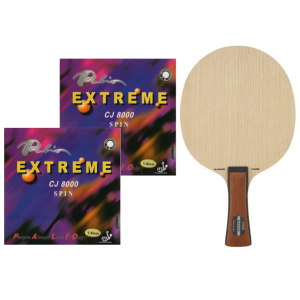 We have put a lot of thought into the topic ping pong paddles for beginners and persons who are starting in a club. Also for established and advanced (or professional) table tennis players, we constantly comply many table tennis paddles. Because of our deep experience, we pre-configured excellent blade-rubber-combinations. These are then offered as professional table tennis bats in our shop - including attractive discounts! Our best-selling test winner is the Stiga Allround Premium Spin. This table tennis racket provides all a table tennis beginner needs. 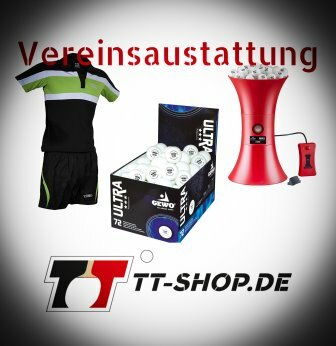 The speed is classified as allround, hence, there is always sufficient control in order to be able to learn and acquire all basic table tennis techniques (e.g. topspin, counters, shots, backspin). 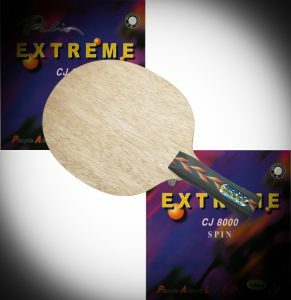 The Stiga Allround Premium Spin is based on the Stiga Allround Classic, which is the best-selling table tennis blade worldwide. It is highly appreciated, especially by allround players. The rubbers used are called Palio Extreme Spin. These are -qualitatively speaking - not different from the Japanese classics. Hence, they constitute a good and inexpensive alternative. For this reason, the overall price of this TT bat is below 60 Euro. As an alternative to the Stiga Allround Premium Spin, we offer our professional allround table tennis racket, which is equipped with Japan rubbers. In terms of playing characteristics, this paddle is a bit superior (better). Due to this (the Japanese Donic Quattro rubbers are used), it is - justifiably - also a bit more expensive. Also very important to mention: Our table tennis bat for kids, suitable for young table tennis beginners. This bat is of equal (high) quality compared to other allround bats, however, it exhibits a special handle, and a smaller overall blade/head - perfect for children´s hands. This allows a pleasant feeling, and a very positive handling. 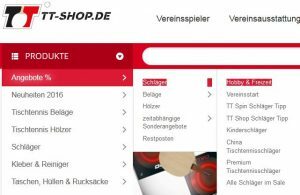 In case you are having questions regarding what table tennis racket would be a good choice for you, please do not hesitate to contact us! We are very happy to answer your questions!